Speaker Boehner and his Budget Committee Chairman Paul Ryan are out with a new graphic to support their claim that "spending is the problem." I agree that spending is the problem (as opposed to the President's theory that insufficiently high tax rates on the "rich" are the problem). But I don't think the graph is particularly useful. The big spending mountain in the graph is between 2025 and 2041. That is a long, long way away. 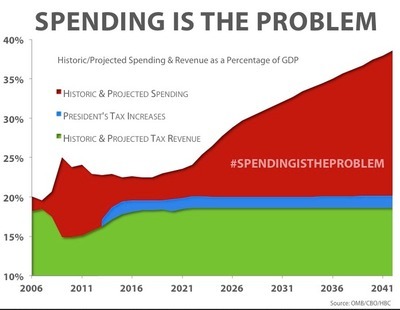 What the graph shows is that "spending will be the problem." Without a better explanation of the basis for the projections of this spending — expensive end-of-life health care for baby boomers? the compounding effect of interest on the national debt at higher interest rates? a war with China? — it's hard to see why anyone would take it seriously. Surely the House Budget Committee of 12 or 29 years ago couldn't accurately predict today's spending levels. Why would anyone trust the projected spending levels that far out this time around? Sure, some long-term planning can be a useful exercise, and we don't want to spend so much now that it leaves the people in 2025 and 2041 with a huge pile of debt to deal with. It's good to have leaders that think about the long term. But I'd be happy if Speaker Boehner, Chairman Ryan, and President Obama could get the budget to a reasonable level of balance in the next four years. Let the Congress and Speaker in 2041 worry about 2041. They'll have better information than we do.